For other uses, see Shack (disambiguation). A shack (or, less often, shanty) is a type of small, often primitive shelter or dwelling. Like huts, shacks are constructed by hand using available materials; however, whereas huts are usually rural and made of natural materials (mud, rocks, sticks, etc.) shacks are generally composed of scavenged man-made materials like abandoned construction debris, repurposed consumer waste and other useful discarded objects that can be quickly acquired at little or no cost and fashioned into a small dwelling. 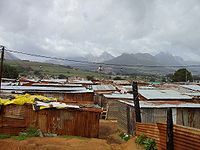 In areas of high population density and high poverty, shacks are often the most prevalent form of housing; it is possible that up to a billion people worldwide live in shacks. Fire is a significant hazard in tight-knit shack settlements. Settlements composed mostly or entirely of shacks are known as slums or shanty towns. In Australian English shack can also refer to a small holiday house with limited conveniences, for instance it may not have running water or electricity. In oilfield drilling (Canada) a shack can also be the word for a wellsite trailer. Structures that were once notorious among oilfield workers for being cramped, uncomfortable and generally unpleasant to be in are now no longer good enough for companies that are serious about employee retention. In relatively affluent areas, shacks are often used for storage or have been abandoned. 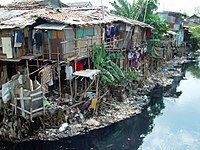 A multi-family shack in a riverside shantytown, Jakarta, Indonesia. Wikimedia Commons has media related to Shacks. 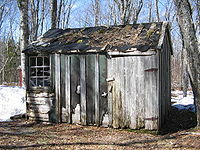 Look up shack in Wiktionary, the free dictionary.